- So it was a sad sad day when I accidentally fried my Buffalo WHR-G125. I did something really stupid. Don't plug a 12v ac adapter into a device that only takes 3v (that's what happens when you are moving your router and DSL modem at the same time and accidentally cross the ac adapter wires). There was an instant burning smell, and umm yeah all I get is the diagnostic light on all the time. It was a really great router, ran dd-wrt great, and was only $25. Oh well, out with the old and in with the new. - To replace it I was still considering the linksys wrt54GL for around $50-60. But then I read up on the linksys wrt310n which also fully supports dd-wrt. I got it from buy.com for $95 with 2 day shipping. - I completely ignored the included CD and the LELA garbage. I don't want it or need it. - It's only single band (no 5ghz). - NO jumbo frame support on the built in gigabit switch. - I really didn't test the original firmware at all since I knew I wanted dd-wrt on there as quick as possible. First, download dd-wrt v24 sp1 from here. You'll need both dd-wrt.v24_mini_generic.bin and dd-wrt.v24_std_generic.bin. Flash the mini generic first then the std generic. Flashing was even easier than the buffalo. I just hit the router with my browser (default ip: 192.168.1.1), logged in (default password: admin, leave user blank). Go find the firmware upgrade page: administration|config management. Browse for the appropriate dd-wrt file you d/l above and away you go. Again, FLASH AT YOUR OWN RISK! - Heat: It does get pretty warm. Using my IR thermometer gun the top is around 112F and the underside gets up to 125F near the center. I decided to prop it up on some blocks just to let some more are flow down there. - So far stability has been very good. I've been running it under heavy load for about 10 days now without issue. No reboots needed. Heat doesn't seem to be an issue. - Performance, Qos, ping tests, etc are all pretty much identical to the buffalo so just read that review for the details. I'll focus on the wireless-N which is the only thing significantly different about this router. For QoS I'm still using HTB, up 500, down 4800. 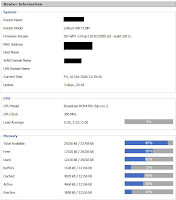 - To test 802.11n I used my dell inspiron 8600 laptop (vista 32bit ultimate) which only has intel based 802.11b/g built in. So I also picked up a few N adapters. WPA2 AES is enabled for all tests. 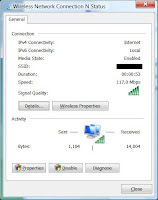 - I used the same network benchmark methedology as I did on my Gigabit ethernet upgrade. 3 - downstairs in the family room. All 802.11g tests were done in mixed mode. Extract them, plug in the usb N adapter, then browse for the driver to where you extracted them. I'm fine with using just the built in Vista stuff to manage my wireless connections. - linksys wpc300n v1 wireless-n notebook adapter. $30 shipped from newegg. Again, I wanted just the raw drivers installed and did not install the linksys management software. You can get the latest driver here. - I think test #3 was the best because of how the antenna on a pc card faces. It works better when it's in a vertical plain from the router. - Basically, wireless N is a complete bust in it's current draft form and implementation on dd-wrt. I tried other settings which are available in N-Only mode like channel width and setting wireless channel to auto to no avail. I didn't see any speed increase or better range from MIMO than what I get over good old 802.11g. From what I've read performance is much better if you use the same hardware across the board and the original firmware. Since I flashed dd-wrt right away I didn't get a chance to test with the original firmware. Since it's all draft still, many of these companies still use proprietary algorithms and tricks to improve performance. Obviously dd-wrt doesn't have access to these. Maybe things will improve once 802.11n is finalized. Either way It's not a big deal to me since I'll take dd-wrt and QoS over increased wireless speed any day. If I need speed that's what wired gigabit ethernet is for. Most of the time I'm just surfing so N is moot. It just would have been nice to have a bit of a boost for the rare times I copy large files to/from the laptop. I ended up returning the airlink but I think I'll hold on to the linksys for now on the off chance that things improve once 802.11n is finalized. Also, it might help that the pc card is the same manufacturer as the router. Highly recommended. It's still a great router even if the wireless N is kind of pointless when using dd-wrt. It still has a gigabit switch built in which is handy. 802.11g works as good if not better than my buffalo. DD-WRT is stupid easy to flash and has been working very reliably. Price is a bit high. I guess if you don't need the gigabit ethernet, and you don't want to make the bet that maybe 802.11n will improve when it is finalized (and dd-wrt is updated to use 802.11n final specs, and the pc card has a firmware update and/or driver update, so yeah that's quite a bit to bet on), then the linksys wrt54gl would probably be the better value. If you turn your 310N upside down, you can take advantage of the numerous holes for heat dissipation... ;) (that's what I've done with my 310N... and my buffalo died a similar death). Almost the same here with my wrt300n v1.1. I bought it from buy.com for 54$. I bought 2 wireless adapters to match this router (linksys wmp300n and airlink awlh6070). Performance of both these cards are on the same level 27 - 30 Mbits/sec. In DD-WRT there are two Mini Bin file. One is dd-wrt.v24_mini_generic and the other one is dd-wrt.v24_mini_wrt310n. Which one should I use? Read the peacock thread on dd-wrt.com. Recommended builds to what one needs to know about the firmaware will be covered. Do your DD.